ACROBiosystems is an internationally recognized manufacturer of recombinant proteins committed to supporting cancer immunotherapy. 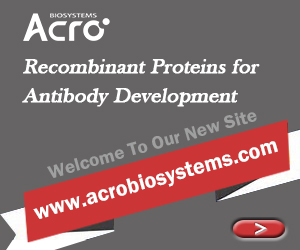 ACRO specializes in mammalian cell-based recombinant protein production and process development. ACRO’s goal is to support professionals from pharmaceutical companies, CRO, and research institutes in the field of immunotherapy by providing high-quality proteins, antibodies, and assay kits. ACRO have multiple offices and branches in North America, Europe, and Asia, spanning over 50 countries. With years of experience, ACRO have established their own brands: MABSol® proteins and assay kits. The MABSol® brand products cover every step of the antibody drug development pipeline: diverse antigens for injection and selection; MABSol® Biotin Labeled Proteins for assay, immuno-capture and quantitative analysis; MABSol® Five-Minute MAB Isotyping Kits for antibody isotyping, purification media and MABSol® Fc Receptors for antibody optimization.